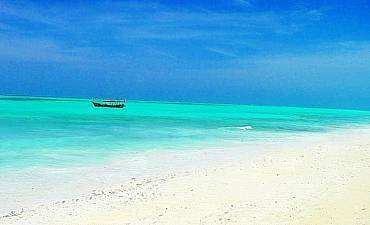 Need Help With Stone Town Accommodation? Scroll Down For More Details.. 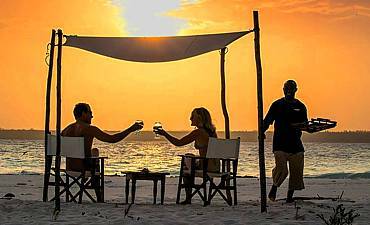 If you are looking for a Tier 1 luxury oceanside accommodation that allow you easy accessibility to Stone Town, a UNESCO World Heritage site with its many cultural and historical attractions , then Zanzibar Serena Inn should be your first choice. They have 51 rooms in all and among them, 41 are Standard Rooms and 6 are ocean-facing Prime Rooms. They also have a collection of Suites, 2 Executive, 1 Presidential and 1 Honeymoon Suite. 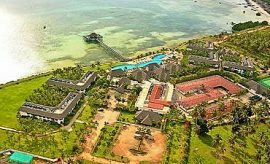 This seafront inn has an appealing Swahili ambience with air conditioned rooms that include mosquito-curtained beds and en-suite bathrooms. Some rooms also have a hammock in their balconies with a view of the vast Indian Ocean. The Jafferji House is yet another premier accommodation but suited to the travelers who are looking for a Tier 1 boutique accommodations in the heart of Stone Town, a perfect location with its buzzing setting amidst residential housings. They have a collection of Signature, Superior and Deluxe Suites with christening themes of various historic personalities to island attractions e.g. Livingstone Suite, Mercury Suite, Stanley Suite, Spice House Suite, Princess Salme Suites. All the rooms include the amenities typical of a frill establishment i.e. flat screen television, in-room telephone, hairdryer, safe, air-conditioning and more. 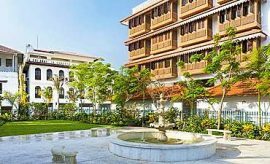 If you prefer an international branded hotel, The Hilton Hotel in Stone Town would be your alternate AfricanMecca Tier 1 option. Guests looking to experience the old world charm of living in a traditional Zanzibari merchant mansion on their cultural vacation in Stone Town will love the charm of the Emerson on Hurumzi. This deluxe accommodation comes as a pleasant surprise at the end of a small alley. 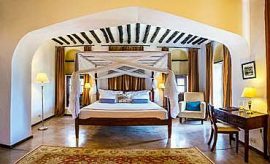 Offering 16 rooms in all, it features intricately painted murals on the walls, hand-crafted carved furniture and four-poster Zanzibari beds with diaphanous mosquito netting. The doors are embellished with beautiful metal studs while the latticed windows set at a higher level allows ventilation but also accords privacy. 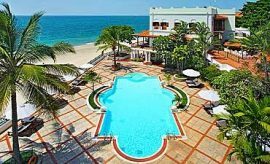 As one of the highest building in Zanzibar, you could climb to its terrace and enjoy expansive views of the yesteryear metropolis spread out below you. Their Tower Top Restaurant is located here and as you have your meals, you could revel in the sight of blue and white roofs, old church steeples, mosque minarets and hindu temple, all somehow blending effortlessly with each other to create a distinct pastoral skyline, a faithful testament for inclusiveness of varied cultures (read more on tour activities in Zanzibar). 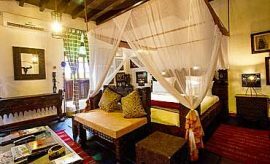 For an AfricanMecca Tier 3 Stone Town hotel, we recommend Dhow Palace, a former merchant house that was built in 1559. Today, it is a highly dependable value accommodation offering only 30 rooms. 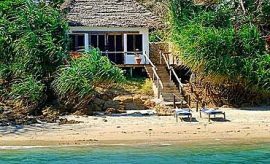 But, if you would rather prefer an economy beachfront lodging close to Stone Town on the western part of Zanzibar, then the Fumba Lodge located in the Menai Beach Conservation area is ideal for you. 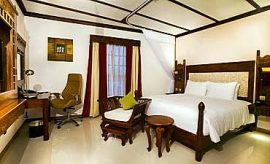 They have 26 rooms in all of which 20 are Deluxe Bandas sited in cottages. Some of these rooms face the ocean while others offer garden views. If you prefer more spacious living areas for your ocean trip in Zanzibar, you could opt for their 6 Suites set on the beach. Choose from their 4 Luxury Suites or 2 Baobab Suites. 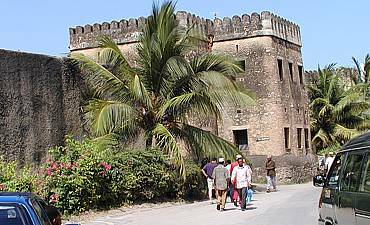 Other western sector seaside hotels close to Stone Town are Mtoni Marine and Mbweni Ruins Hotel. 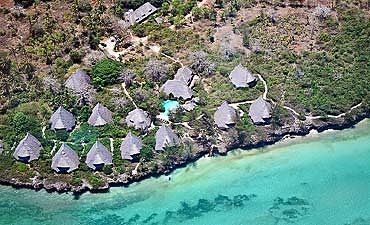 Other options are Zanzi Resort and Sea Cliff Resort & Spa which are around 20 minutes from Stone Town.